Most of you know that I live in Istanbul. Naturally, I have an interest in things related to the Middle East. The Twelfth Imam , which my husband had read a couple of years ago, was a really fun read. I’d been having a little bit of trouble jumping into a book as I had been swamped with research and writing for the last few months. But, thankfully, this one got me out of my rut! 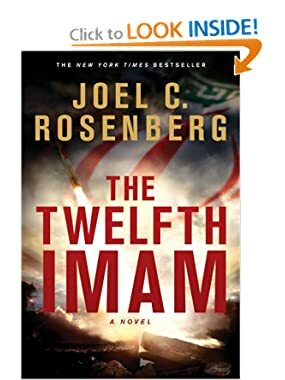 The Twelfth Imam is written by Joel Rosenberg who has been studying and writing on issues related to the Middle East, Israel, and religion for the last several years. This book feels very well informed, which makes it a more interesting read. Rosenberg starts his book off with the great, but little known American story of Argo. (By the way, a great film! Something American’s should know about!) Argo was a secret operation undertaken during the Iranian hostage crisis of 1979. The Twelfth Imam starts here and follows the story of an American and Iranian family who escape the tumultuous country of Iran to the safety of America. Years later, the families have settled in small American towns, had children, and started new lives. When the youngest children are teenagers, the fathers get back in touch, and they attend a company retreat the weekend before America was forever changed by the acts of a few men on planes. September 11 drastically changed the lives of some members of these families, and they set in motion the events that would drive the rest of the book. From a successful New England doctor’s son to a high-ranking CIA position, David Shirazi is going to serve his country and his family well by entering a country on the verge of perfecting their nuclear weapons base. At the same time, the Islamic world was turned upside down by the ascent of the Twelfth Imam, the prophesied leader who would come to usher in peace in the last times. David is in a race to try and find the crucial information that will keep the world from seemingly falling apart, be it by nuclear weapons or mass conversion. Will he be able to protect those who mean the most to him? Will he be able to set aside the rest of his life for the good of his country? The Twelfth Imam is a thrilling and fast paced book. The story line is well-developed, and there was little to criticize regarding the writing or the plot line. This is the first in a series of books, and I’m sure that you’ll be interested in picking up the second immediately after finishing the first! I think that this book would be especially beneficial to read as a family to address issues of faith, religion, and current events in the world. Rosenberg’s books do not contain any objectionable material, which makes them suitable for a family context, and while he does not dictate your thoughts, he does give a clear presentation of events that ought to be discussed with young people in today’s world. My one criticism, if it can even be called that, is that Rosenberg does raise some issues (from a Christian standpoint) that are not easy questions to answer. Perhaps it is because of that that he does not give a clear answer as to what he believes is happening, but I think that some of his questions are really important to understand. The biggest issue is this: does God, and if He does, how does He use dreams and visions for His modern purposes? This is a real issue that we are facing in the world today. This issue is raised in The Twelfth Imam, but Rosenberg does not give much indication as to his own thoughts on the matter. He leaves it to us to run to the Bible and find our answers. What do you think? Does God use dreams and visions today? What would be your response to someone who said that they learned about Jesus from a dream? I would honestly recommend this book to anyone regardless of age, ethnicity, or religion. I’d love to hear your thoughts on the story and your answers to some of the questions! Don’t forget, if you are looking for something good to read, check out my page of suggestions! !